Launched in 1967, the Sea-Dweller is the ultimate tool watch. Originally conceived for dive expeditions, the model was officially introduced for civilian use in 1967. 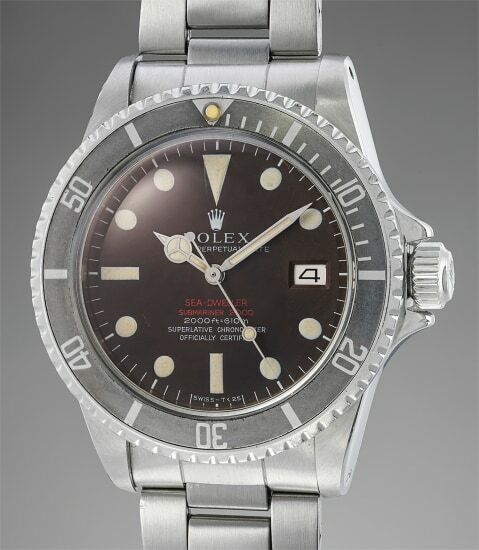 While the earliest prototype examples featured single line bearing "Sea-Dweller" in red, Rolex later printed both the depth rating and Sea-Dweller signature in red. The Sea-Dweller's biggest technical innovation was the helium escape valve. During the 1960s, most watches did not have the capacity to submerge into great depths without breaking. The Helium Escape Valve allowed helium gas, which built up underwater, to be released during decompression. This impressive Sea-Dweller is fitted with a Mk2 dial, which has turned a beautiful and even tobacco tone over time. Correct for a 1.7 million serial number, Mk2 dials are distinguished by the small base of the coronet. It is remarkable how even and rich the brown tone is. Furthermore, the case is preserved in excellent condition with incredibly crisp bevels and sharp edges. The inside caseback is furthermore stamped with the last three digits of the serial number, which is correct. Of particular note is the "PATETED" engraving on the bracelet. Rolex had made a typo when manufacturing the bracelets and mounted them anyway. Today, these bracelets are particularly sought-after by collectors.